Picture a miserably cold day on Nova Scotia’s Bay of Fundy in November of 1988. Three young girls can’t conceal their disappointment as they stand shivering by a spruce tree. It lists to the right, its posture permanently shaped by winds racing up from the bay. “What about this one?” Grinning, my husband points to another equally sorry-looking specimen. You could easily drive a football through the yawning spaces among the branches. Just an hour earlier our girls had piled into the van for the drive up the mountain, their spirits high. An axe, an old two-handled saw and coiled rope accompanied them – all the equipment needed to snag a Christmas tree. Now it was obvious that the hunt for a tree wouldn’t live up to expectations. 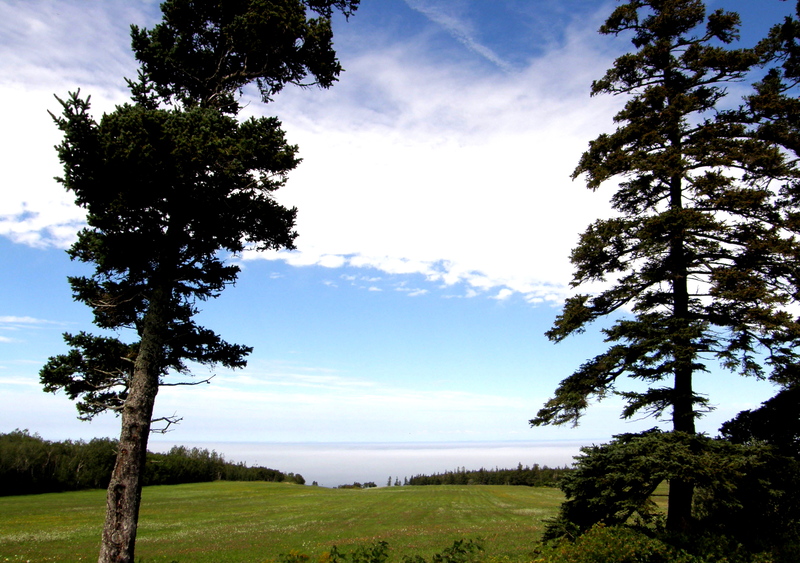 They made a last survey of the evergreens dotting the slope down to the choppy waters of the bay. Every tree displayed evidence of consistent exposure to the elements. My husband was thrilled with the lop-sided Charlie Brown Christmas tree that he culled that day from his grandfather’s farm on the north ridge of the Annapolis Valley. Gramps had long maintained a custom of cutting down a wind-carved spruce from his own property for the festive season. The less symmetrical the tree, the more satisfaction he seemed to gain from his choice. It was obvious that his grandson would follow in his footsteps. The man whom my husband idolized was eighty-four years old at the time we moved to Nova Scotia. A woodsman and cattle farmer, Gramps could still repair barn roofs, drive the tractor, and toss bales of hay onto the wagon. “Tougher than a boiled owl,” is how one of his neighbours on the mountain described him. Initially, the girls and I resented the Gramps-style Christmas trees. 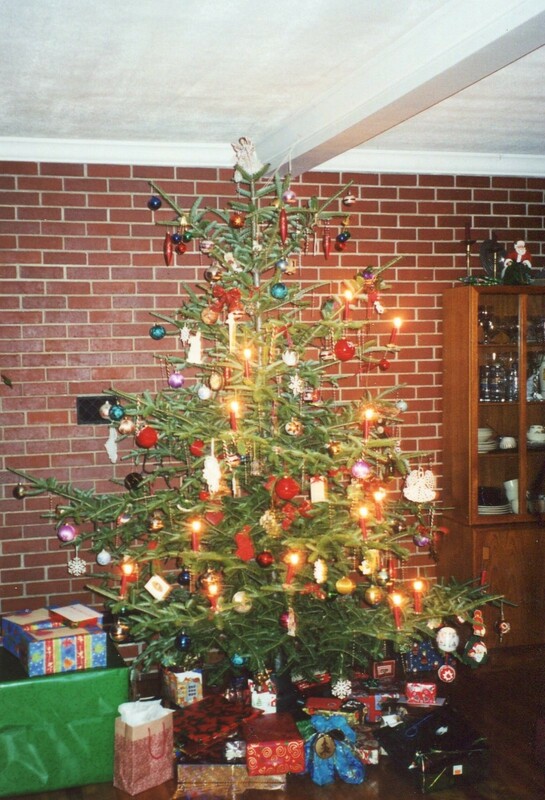 In 1991, the first year that we took our standard poodle on the tree hunt, the girls even slung a sign around his neck: I refuse to come home with an ugly Christmas tree. It didn’t help. Over time, however, we came to value them for their distinctiveness. Friends and neighbours would drop by to see them – they’d rapidly become a local legend. 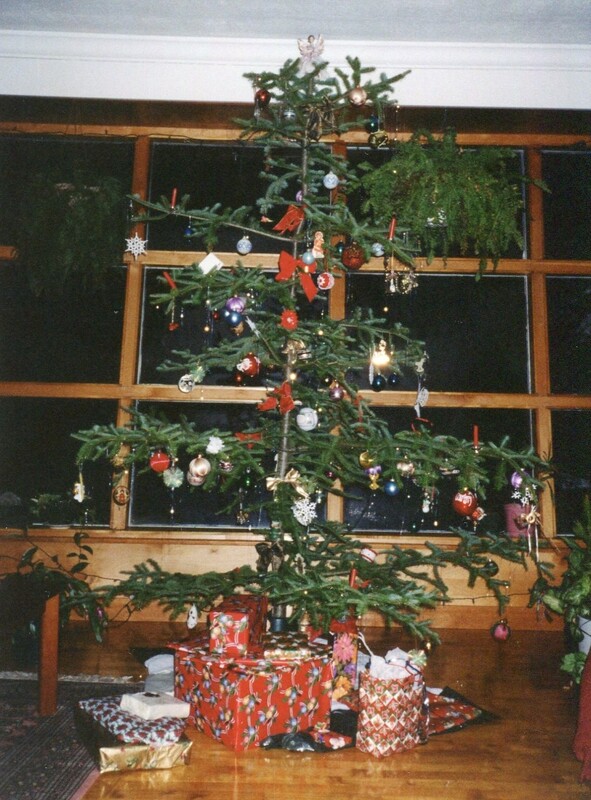 The girls adorned each year’s tree with home-crafted decorations, or ones they had made at school. And the wide spaces between the branches provided room for the candles that were part of my German heritage. Every year we would have carol sings (a bucket of water close at hand) in the golden light of those candles in their snap-on holders. O Tannenbaum, Silent Night, Angels We Have Heard On High…my husband’s baritone voice would lead us. In June of 1996, just as the haying season was beginning, Gramps contracted pneumonia and died peacefully, in the farm homestead, at the age of ninety-two. Five years later, in July of 2001, his grandson – my husband – passed away from cardiac arrest at the too young age of fifty. Soon after Joe’s death, I moved out west to Calgary. I continued the tradition of a live tree for a few years, even helping to chop down a specimen one year on crown land south of the city. Then I resorted to lot-bought ones that shed their personalities as readily as their needles. And three years ago, I did the unthinkable: I brought home an artificial tree. The act struck me as heretical, but I could no longer manage the live trees on my own. I soothed my conscience by noting that the live trees had always given me the sniffles, and that they declined rapidly in Alberta’s notoriously dry climate. In essence, I created a new convention. The Charlie Brown Christmas tree tradition, however, remains a powerful unit in my memory bank. It harks back to a happier, less complicated phase of my life. The annual harvest of our tree was a ritual that provided the perfect combination of comfort and excitement. Above all, I’m grateful for this tradition’s legacy to my children. They enjoy the simple things in life, and they also have a special appreciation for the unique and the off-beat. Candles lit on one of our Charlie Brown Christmas trees.